MOKSHIVA ENTERTAINMENT PRESENTS MIDNIGHT FLIGHT 2014 TO PARIS !! This is a wrist-band access Event. Wrist-bands will be issued at the Event and will enable access to both the zones . In case wrist-bands are taken off, a replacement wrist-band will not be issued. Entry permitted to guests above the age of 10 years . Alcohol will be served to guests above the legal drinking age (LDA) & on display of valid age proof. LDA bands will be provided at the venue on proof of Age. Each Stag ticket admits one person And Couple tickets two person only. Organizers' reserves the right to perform security check on invitees/member of audience at the entry point for security reasons. Organizers or any of its agent, officers, and employees shall not be responsible for any injury, damage, theft, losses or cost suffered at or as a result of the event of any part of it. Parking near or at the EVENT premises is at the risk of the vehicle owner. Organisers' will not hold responsibility for any damage or theft of any vehicles within the stipulated parking premises of the Event. Midnight Flight 2014 to Paris New Year Party in Mumbai is a fun filled New Year’s Eve party,which is all set to happen in the nation’s entertainment capital Mumbai. 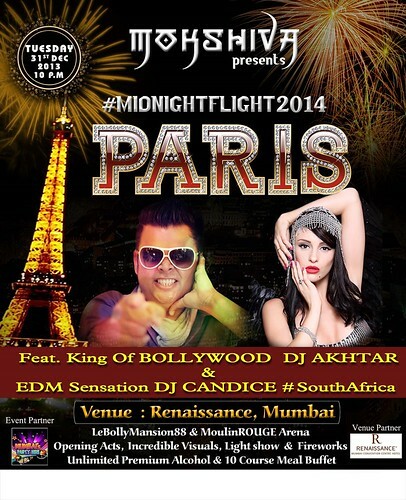 Renowned for organizing head turning events, the Mokshiva Entertainments, is hosting the Midnight Flight 2014 to Paris New Year Party in Mumbai featuring DJ Akhtar and DJ Candice Redding from South Africa. Get set to welcome the New Year in the amazing ambience of Renaissance Powai Ballrooms, while grooving to the feet thumping music of the DJs that have been roped in to make your day eventful. Apart from the feet tapping music, ambience and the international artist line up, the wide spread buffet with a ten course meal made out of the best of Indian and French cuisine makes it for an added reason to be there at the Midnight Flight 2014 to Paris New Year Party in Mumbai. YES , above 5 years. Is parking free or chargeable? You are invited to attend MOKSHIVA ENTERTAINMENT PRESENTS MIDNIGHT FLIGHT 2014 TO PARIS ! !